David Larible is part of the 7th generation of a family traditionally dealing in the world of circus, related with the Travaglias. Born in Verona in 1957, he’s on the stage since very young, performing in the most various disciplines, in order to obtain an enciclopedic education. His family is hired in the main Italian circuses (Medrano, Darix Togni) and European ones (Nock, Bouglione, Krone, Tower Circus e Teatro Carré). In South America they’re collaborating with Tihany, Atayde and Fuentes. 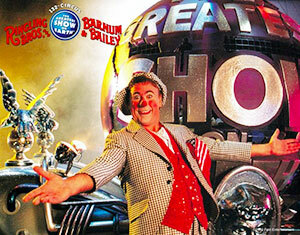 Since 1986 to 1988 he’s fixed guest of the German television program “Stars in der Manege”. In this way he acquires a set of really impressive experiences which contributes to further embellish his natural capabilities. At Krone’s, one of the most important German circuses where his family is hired, he’s offered the chance to entertain the public at the entrance, before the show. 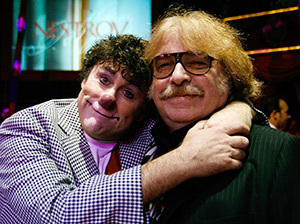 In this way he has the opportunity to observe from nearby two of the greatest clowns of the century: Charlie Rivel and Oleg Popov. 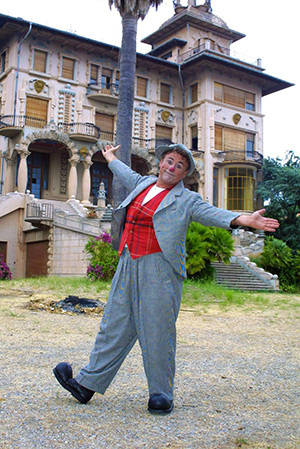 In the same years he defines his character: a classical “augustus” with plain grey clothes, in contrast with the cheerfulness expressed by a hat like the one of Jackie Coogan in "Il Monello", a light make up and the traditional red nose. He mainly focuses on short original tracks, renewed everytime, to be performed between one show and another. In 1988 he’s called by Prince Ranieri to the Montecarlo Festival, where he won a Silver Clown. The following year he takes part to the festival , out of competition. In South America, in the Atayde Circus, he gets the chance to face the big public in the stadiums with a capacity exceeding 8.000 places. He’s noticed by Kenneth Feld, president of the most important live show producer in the United States, who hires him as first clown in the history of Ringling Bros. and Barnum & Bailey who appeared as star of the central ring. At Ringling, where he’s called "The Clown of Clowns", the production process requires a continuous renewal of the clown show. Therefore David changes his own approach to creativity, drawing ideas from the classical repertoire and adding, in the way of the comedy of art, fundamental innovations personalizing or distorting the pre-existing plots. His very long experience as a trapezist, a skater, a juggler, a dancer, a horse acrobat and more, has given him a stout and at the same time nimble physical structure which he has alway controlled at will enriching his performances with a great mimic potential. The success he met with everywhere in the United States, where there is a multiracial audience, shows the universality of his comic spirit. In 1996 he started his stage carrer with a "one-man-show" the title of which was "Excuse me do you want to partecipate?" which was performed several times. In that show we saw his best performances in a fluent and coordinate way. As it is clearly explained in the title the show was mainly based the interaction between the audience and the artist his favourite modus operandi. 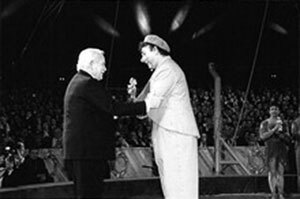 In 1999 in the Montecarlo Festival he was awarded the Golden Clown, the first artist of that kind who was able to win such a prize after the prizes to the career which had been awarded in the past to Popov and Charlie Rivel. He was also the star of a show called Barnum's Kaleidoscope performed first in Broadway and later in several other American cities. In 2005 he went back to Europe and in 2006 he was called by Bernhard Paul, manager of the Roncalli Circus in Germany and at once he becomes the indisputable star of that show. In Germany he found the perfect environment and atmosphere for his involving kind of comic spirit. In the same year together with the greatest circus artists who like him had been awarded prizes in the previous editions, he took part in the celebrations for the 30th anniversary of the Festival of Monte Carlo Circus. He was also spotlight chaser of several theatrical shows in many European cities and he was again absolute star of the stage. In 2007 he was awarded another prize: the Grock Trophy of Imperia. 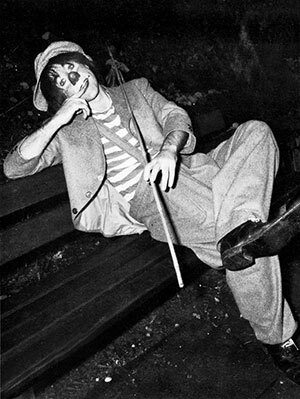 At present he is performing the show “Smile” at Circus Knie in Switzerland, and in several European cities with iss theatrical shows "Destino di Clown" and "Il Clown dei Clown" together with his partner and the pianist Stephan Kunz. David's activity is not limited to all that we said. He ofte takes part in special events, workshop and university lectures. David's family is native of France. He was preceded by six generations of artists. He was related to several European circus families. His grandfather Pierre Larible was a dancer , an acrobat and a clown. His father Eugenio Larible was a juggler and a great artist of the Washington trapeze. His mather Lucina Casartelli was an artist and manager with her brother Leonida and her sisters Jonne and Liliana of several Italian circuses, among which the great Medrano Circus. David has got three sisters, Eliana who married Bernhard Paul (manager and clown of the famous Roncalli Circus), Cinzia Larible-Gerard and the trapezist Vivien who married the acrobat Noè Españas. David married the Mexican trapezist America Olivera Jimenez. 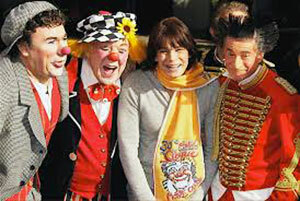 They have two children, Shirley and David Pierre, who are circus artists.